This week we turn to a pedal from a builder from Oklahoma in the US of A: Walrus Audio. 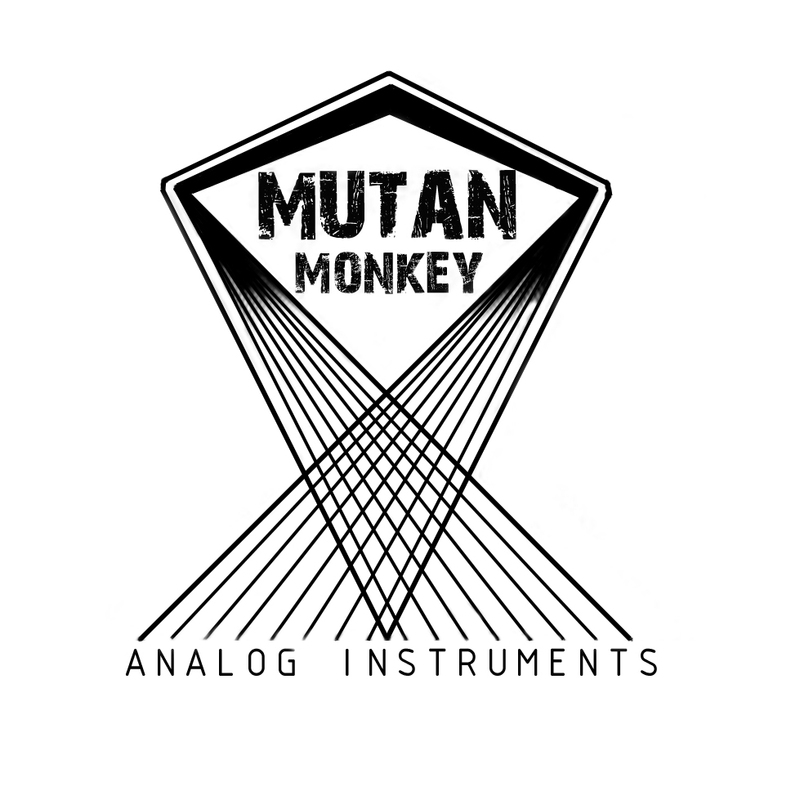 Walrus have got a variety of devices in their catalogue, which range from the conventional clean boosts and overdrives to the more outlandish over-sized analog delays and reverbs. One thing that unites all of these is their beautiful, instantly recognisable artwork. 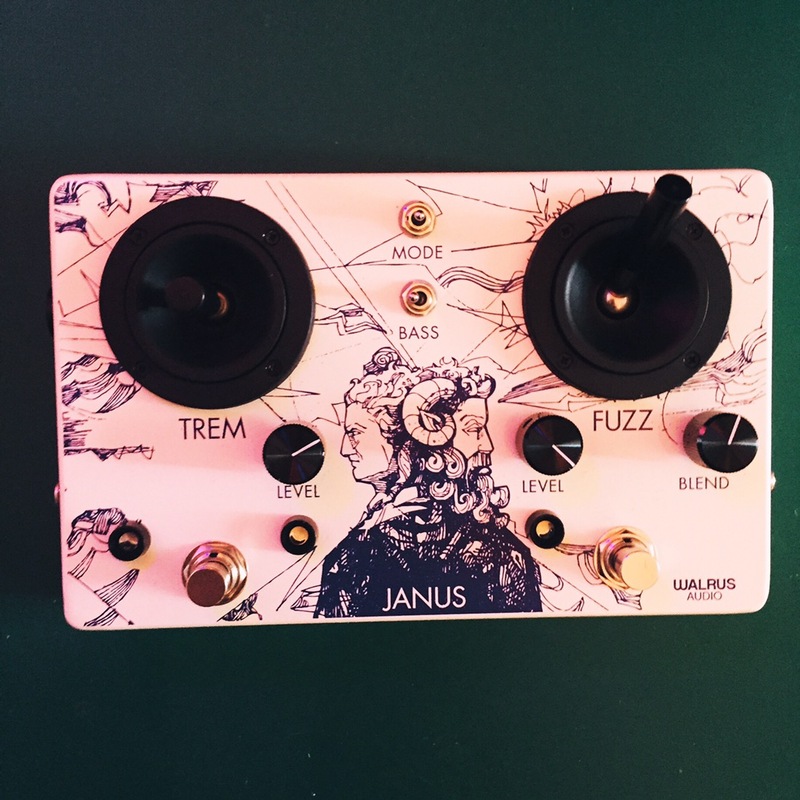 We were lucky enough to get our hands on one of their more unusual pedals – the Janus Tremolo Fuzz – and so that’s what we’re going to be looking at in this thrilling instalment. Pedals aren’t just for guitarists. The Janus was seriously impressive looking from the moment that it came out of the box. As well as being one of the largest pedals we’ve ever seen, the joysticks and beautiful illustrated artwork culminate in an imposing package. This thing has got a lot of presence, and it looks amazing; definitely a device that brings about a strange sort of pride of ownership before you’ve even touched it… and touch it you’ll want to. The tremolo effect works nicely on synth lines to give a bit of warble and character, which is obviously easily controlled by the joysticks. 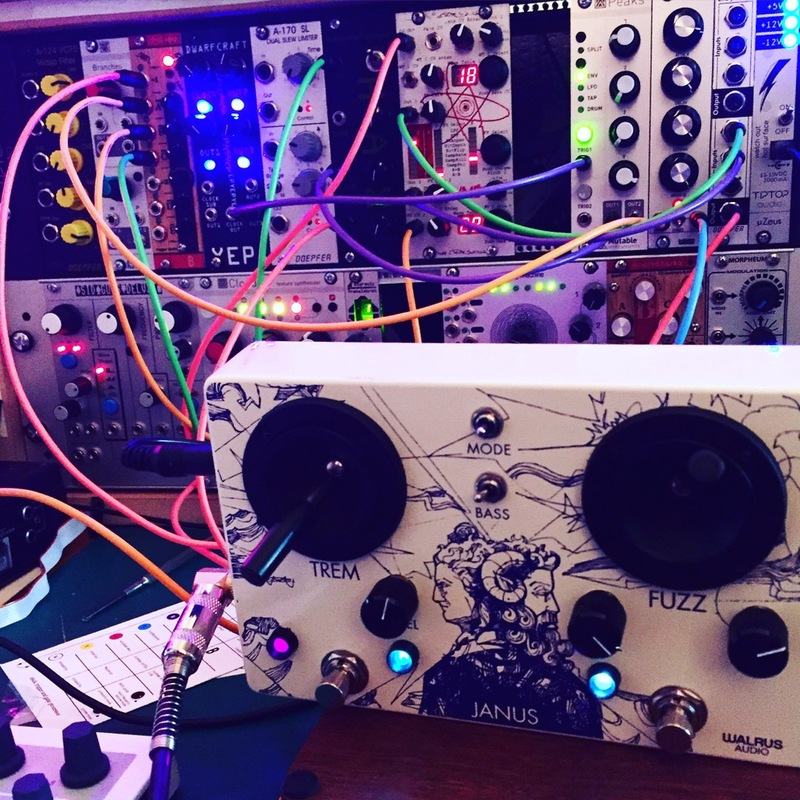 That said, while I liked the Janus at first, it wasn’t until I tried it out with some electronic drums that I was really blown away. Slowly sliding the fuzz controller round from dry to wet and intense brings the most amazing, dirty sounds. It beefed up the rhythm in such an awesome way that I ended up playing about with the same beat for far longer than should have been entertaining. At times, the diodes even began to produce a sort of melodic squeaking sound from being pushed so far. It was brilliant. The way that this pedal can bring out the best in even straighforward drums is reason enough on its own to keep it. 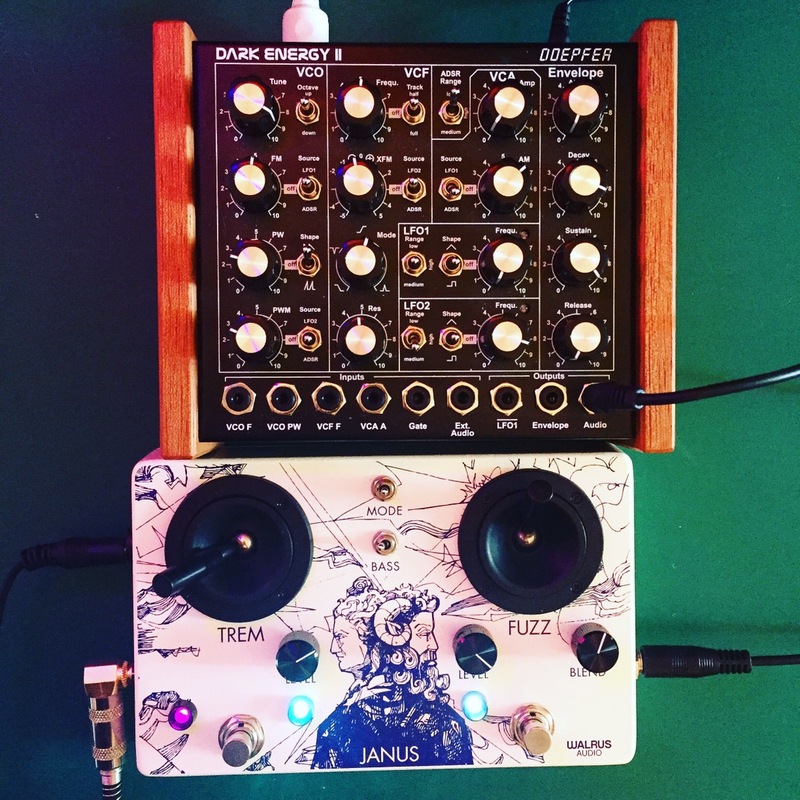 Check out the video below to see the Janus demoed with a Doepfer Dark Energy II, some Eurorack, a Volca FM, and a Volca Sample masquerading as a drum machine. The Janus allows for a greater degree of expression than you’d normally get out of a pedal, and the effects can add a really nice edge to your tracks without completely over-powering them. It seems like it would be an amazing bit of kit to add to a live setup, and I can’t wait to test it out in the wild for real. Two separate joysticks that control the fuzz and tremolo effects. The right joystick controls the tone and amount of fuzz. The left joystick controls the rate and depth of the tremolo. Blend knob for a mix of wet/dry signal on the fuzz effect. Separate level knobs for both fuzz and tremolo effects. Separate foot-switches for each effect, that can be engaged individually (without one or the other having to be on to operate). 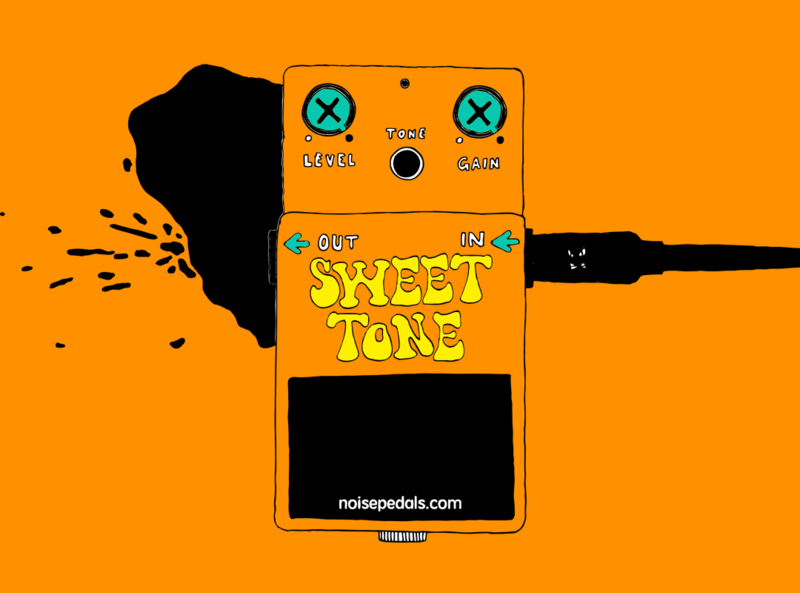 Three different diode combinations controlled by a mode switch to alter the fuzz sound. True bypass, and standard 9v ‘BOSS style’ power connection. The Janus is a really beautiful device, and was a pleasure to use. The joysticks provide a greater degree of expressiveness than you can usually get from effects with knobs and a smaller footprint. This means that the Janus is a pedal that naturally lends itself to electronic musicians or vocalists who can make use of their hands to take advantage of its tactile nature. It seems like this could be the perfect accompaniment to a live performance for those looking to add some colour to the mix… but for me, applying its fuzz circuit to electronic drums is really where it came into its own. I’ve not had that much fun playing along to music with a pedal in ages. You can find Walrus Audio pedals at a bunch of different dealers, as well as directly from them on their website.